Flat Iron Steaks - (12) 8oz. 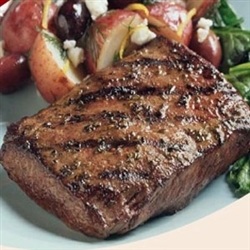 Great for casual entertaining or quick family meals, the Flat Iron Steak is well marbled and tender. In fact, it's the second most tender beef cut - after the Tenderloin. Filet Mignon Kabobs - (12) 8 oz. Pepper Medley Steaks - (6 lb. Pkg.) Tenderloin Tips - (6) 1 lb. Pkgs. Pub Style Burgers - (20) 8 oz. Filet Mignon - (10) 8 oz. Kobe Beef Hot Dogs - (24) 3 oz. Boneless Ribeye - (8) 12 oz. Porterhouse Steaks - (6) 16 oz.